Okay, so I may have a little blog fever... okay, maybe A LOT of blog fever. I'm pretty sure at one point this week I thought it might be a good idea to try to do two posts a week. I was quickly talked down from that, and I'm back on planet I have a full time job-a photography clientele I'm trying to build-and I like to do things other than stare at a computer screen. 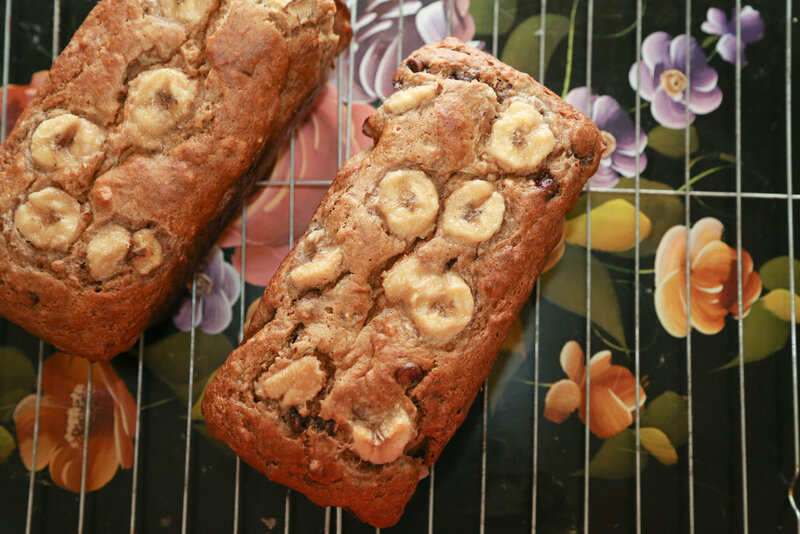 But, while I was going a little bananas this week, pun intended, I decided to step back and make some banana bread (recipe below), and naturally I'm blogging about it. See, I might not technically be cured. Okay, okay, the more I think about it, the more crazy I think I am for ever thinking I could do it in the first place. I mean take this weekend for instance. It's after 8:00 p.m. and I just got back from an awesome weekend spent in the woods with no cell service, no internet, and no electricity, now you tell me how does a person that likes to do that sort of thing blog more than once a week in the first 3 months of blogging. I mean think about it, a few months ago I couldn't even handle doing this thing weekly, sooo I've decided, if I can do this every week for 6 months in a row, maybe, maybe I'll try the twice a week thing. But yeah, in this moment of insanity, I did come up with a few good ideas and couple of great stories, so get excited y'all!! This week was just a little crazy in general. Work was crazy, I was acting a little crazy, and the apartment situation is a little out of control. I made the big mistake of not putting laundry away at the beginning of the week and it's just everywhere (just finished picking it up... an hour later I'm back). So, when Tyler said let's go camping this weekend, I was all in... no technology (emails), no laundry to stare at, no sitting around wondering what to do, and some outside fun was definitely what the doctor ordered to calm me down a little. We had a great time, roasting marshmallows, eating some campfire cooking, and doing a little fishing. Isn't he just so outdoorsy, rugged and handsome? He caught that fish with his bare hands. I love just sitting out on the river, setting up the tent, making a campfire, and talking, just the two of us. I really think everyone should spend at least one night out there in the middle of no where with people they love. There's nothing like the outdoors and great conversation. Really, try it! Well... wait until after next week, I'll have a few tips and tricks for you to remember as you're packing and cooking to make it a little easier. Anyways all in all it was a great weekend to wrap up my crazy week I couldn't have asked for anything more! And now... as promised, my favorite banana bread. There's no butter so there's little guilt, you know except for the chocolate chips and anything else you might throw in there. Sometimes I throw some toasted coconut in, it's a fabulous addition. This recipe happens in three parts. bake for 45-50 minutes or until the top bounces right back when you push it/or the good old toothpick trick works too! Oy Vey! Planes, Trains and Automobiles.